Here we are with the third beer in the collaboration series between Rogue Ales and Voodoo Doughnut.I was really looking forward to this creation, ever since I highly enjoyed the last Voodoo Doughnut beer (Chocolate, Peanut Butter & Banana Ale). This newest one is a Pretzel, Raspberry & Chocolate Ale based after the doughnut shop’s Voodoo Doll Doughnut. The image on the bottle is exactly how the doughnut looks, and is a raised yeast doughnut filled with raspberry jelly topped with chocolate frosting and a pretzel stake through the heart, at least in this case. Each voodoo doll doughnut can look different. I was in such a hurry to get my hands on this beer, that I sent some TX goodies in trade over my good friend, Jorge Espinoza of the website, brewerianimelogs. I’m very glad I was able to do this, as I love to see good TX beers getting proper reviews from someone in California. This Voodoo Doughnut beer has since become available here in TX, and now I see it all the time. I poured this beer into a mason jar glass from Infamous Brewing Company. I just thought a mason jar was fitting for this dessert style beer. The appearance looked pretty tasty, for sure. The color was a dark brown hue with hints of mahogany when shined through with light. It was capped with a half inch eggshell colored frothy head, which had nice head retention throughout the session, leaving a nice sheet of lacing down the glass. The nose was hit first with raspberry and chocolate. The sweetness was impressive, cause it wasn’t so overpowering. I was a bit put off by the fact that the pretzel was well hidden, almost nonexistent in the aroma. I was expecting the pretzel bread or saltiness to be a key player, but was let down. The raspberry and chocolate was then followed by the aroma of the malts. Some caramel is present, brown sugar or molasses. The lingering scent in my nose goes right back to the chocolate and raspberries. Nice and sweet. The taste resembles the aroma. Strong chocolate and raspberry presence. Good taste of cocoa, fresh taste of raspberries are both dominant in the taste. There is a strong malty backbone behind the sweet dessert flavors. Notes of caramel, brown sugar, molasses, some toasted malts, and bread. Nothing that really distinguished the pretzel though. The bready presence is more of the standard quality found in most beers. I was again disappointing that the pretzel was not a stand out. I was really hoping for the pretzel bread taste or even maybe some saltiness, but it was not there. This beer had a medium body, with a smooth mouthfeel, mild carbonation and a moderately dry finish. 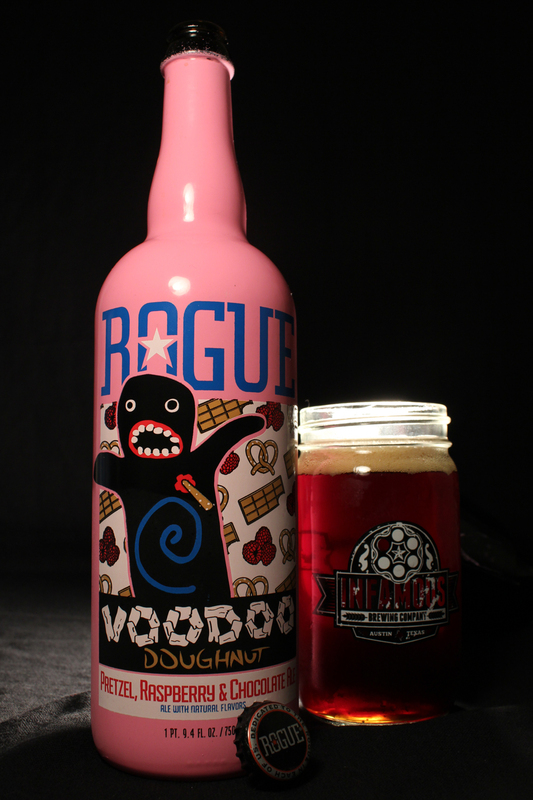 Overall, I will say that this is my 2nd favorite so far in the series of the Rogue Ales, Voodoo Doughnut collaborations. As of now there have been only three, and the Chocolate, Peanut Butter & Banana Ale has been my favorite. This one here, though is a very close second. If the pretzel would have been more present, I’m sure this one would have topped the list. I wonder what is next for this collaboration. I checked out the list of wild doughnuts at Voodoo, and my mind only goes wild to think about beer. Metal Connection: “Voodoo Fire” from the Doom/Stoner Rock masters, Cathedral is the perfect song for the pairing here. I mean here is a beer created around a doughnut that resembles a voodoo doll , complete with a trippy blue vortex design on it’s belly. I can see this image making it’s way onto a Cathedral album cover. 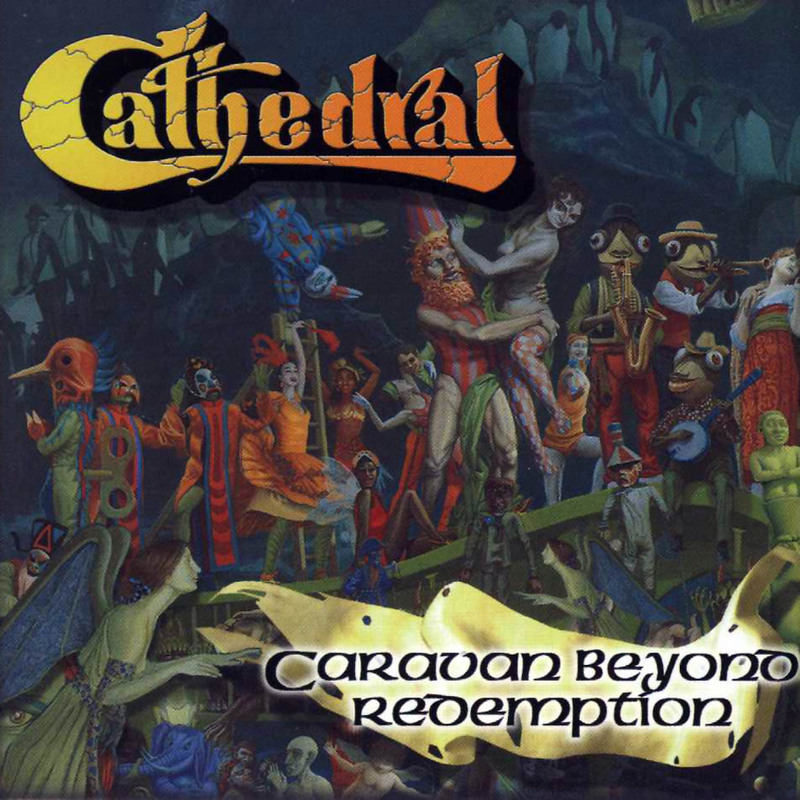 No exception to the cover dawning the 1998 full length album, Caravan Beyond Redemption, which the song “Voodoo Fire” is the opening track. My first real encounter with the band was back in 1992 when their EP, Soul Sacrifice came out and I heard the title track, and was immediately hooked to the psychedelic Doom/Stoner Rock sound. I have since collected every full length album, a few of their EPs, and even had the privilege to see them live back in the 1990’s. They had a long and excellent career starting in 1989 before calling it quits in 2013.